Placeholder data: what is this? Usually ID cards and credentials feature personal data of the bearer. Although customization is available for most items (despite being offered sometimes under certain conditions, see restriction policy page), ID cards and credentials are offered blank as standard. Placeholder data are sample data placed on blank ID cards or credentials, in order to show both what is the correct data required for the field and its graphical appearance. E.G. : the word "Name" is a placeholder data as it indicates where the bearer's name goes and shows graphic appearance of the data itself (color, size, font, etc.). - 00/00/0000: indicates a date, such as expiration date, issue date, etc. - 0000 (or several 0 digits): indicates any number different than a date, such as service number, badge number, serial number, etc. It is important to know what a placeholder data is, because certain items come with placeholder data already printed on them, unless customized. Placeholder data play an important role in the restriction policy, which applies to certain items if shipped to USA or their possessions. See Fig. 1.1 on the right for a graphic explanation. Fig. 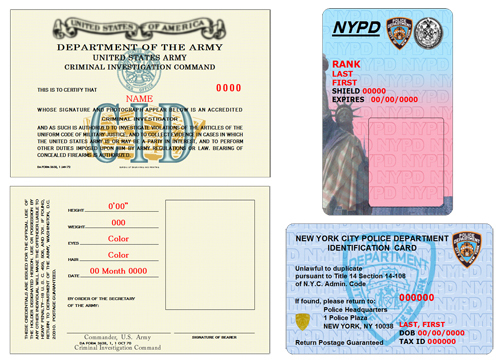 1.1: placeholder data are highlighted in red on US Army CID credentials, '70 (left) and on NYPD ID card, 2000 (right). To U.S. customers: the United States Federal Law (HR 4827, Law #106-547), pertaining to badge possession, collecting, and use came into force on 12/19/2000. This Federal law makes the possession, shipping, and use of Police badges and id cards and Replica Police badges and id cards a crime if they are used for any purpose whatsoever, other than the following: 1. As a memento, or in a collection; 2. for decorative purposes; 3. for a dramatic presentation; 4. for any other recreational; 5. or for fan-collecting purpose. By ordering any badges, you affirm that you are at least 21 years of age and agree to lawful use of the ordered id cards or credentials as explained above. To all customers: we sell (obsolete) replicas of cards, badges and credentials for fan collecting purposes only. We do not authorize or encourage any unlawful use of these badges. Customer should check his/her local regulations regarding the possession and/or displaying of law enforcement badges prior to making the purchase. Customer assumes all the responsibilities deriving from purchase and use of item/s.